Not unlike the debates you’ve probably had over your home floors, commercial property owners regularly wrestle with whether to lay carpeting or solid surfaces in their spaces. The question is typically two-fold: what will have the most durability and which one is easier to keep clean? The short answer is it depends on who you ask. Carpet, historically, has been considered harder to keep stain free — and it will wear over time. But more and more office spaces have successfully used high-traffic carpet or even versatile carpet tiles, especially when there are concerns about masking loud noise. Not only has carpet come a long way in design and durability, but cleaning methods have advanced as well. It is no longer necessary to dump a heavy chemical cocktail to scrub office carpet. Kinder, gentler products are available and effective, but the key is regularity. Commercial carpeting needs to be cleaned often to maintain its professional look. For tile, vinyl, cement, hardwood and other types of solid surfaces, cleaning methods are as diverse as the textures of the flooring. 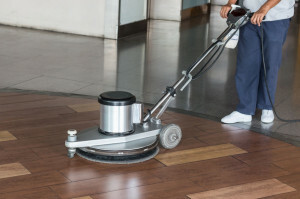 Detergents, soft-bristle brooms and non-oil treated mops are typically part of the cleaning repertoire, as are buffing machines and floor finishes. The porosity of an individual surface also plays a significant role. For these considerations, and more, a professional facilities management company is your best bet to getting it right. Clean commercial flooring is critical for making impressions on employees and clients alike — and it should never be neglected. Fortunately, we have the resources and expertise to polish any surface you put in front of us.